Holiday gatherings and New Year’s celebrations are marked on your calendar, your presents are purchased and (hopefully) wrapped, and the days are numbered before guests are in your home spreading Yuletide cheer. Even with the joy in the air, you can sometimes feel that cold breeze drift through from a door that wasn’t quite latched or returned home from a party only to find all the Christmas tree lights still on from the morning. While minor, these common occurrences during the holidays, can add up and result in a larger-than-usual energy bill come January. Have no fear of the bill collector next month, for our electricians at McAllister Electrical Services want to make sure your holidays are not only merry and bright, but safe and energy-efficient. Today we’re sharing with you some of our favorite tips for improving your electrical safety and usage this holiday season. Do not overload electrical outlets: Overloaded outlets and faulty wires are a common cause of holiday fires. Don’t connect any more than 3 cords of lights to one outlet, and in the kitchen, separate your crockpots where possible. This can prevent overheating circuits and tripping breakers. Protect cords from damage: Cords and strings of lights should never be pinched by furniture, forced into small spaces such as doors and windows, under rugs, near heat sources, or attached by nails or staples. Implementing these practices will keep your lights lasting longer, and reduce electric shock and fire risk. Limit Hourly Decoration Usage: Set timers for your lights to automatically turn on during your desired hours and off again overnight or after sunrise. This will keep your energy usage down and therefore your costs! Take care of real trees: Water real Christmas trees daily to prevent from drying out. If a tree’s needles get too dry, they are susceptible to fire from the electricity running through the light cords. In addition, keep trees at least three feet away from fireplaces, candles, heating vents or lights. Outdoor lights: Make sure to use only outdoor-safe light strands and plug them into a ground fault circuit interrupter (GFCI) outlets. These outlets are designed to shut off the flow of power whenever a short is detected. Don’t peek in the oven: Every time you open the oven door, the temperature drops by as much as 25 percent. Getting it back up to temperature takes more energy, so keep the oven door closed. Similarly, keep the lid on the pot or slow cooker too, and wait patiently to save energy. Lower your thermostat: Save on energy costs and keep your guests comfortable by turning down your thermostat by 3 degrees. The house will stay warm, even with this reduction due to body heat and appliances in the kitchen. Bonus: Check your smoke detectors: We say this a lot, but it bears repeating. Take this time to double-check your batteries and discuss your fire preparedness plan with family members. As you finalize your holiday preparations, keep the above tips in mind. 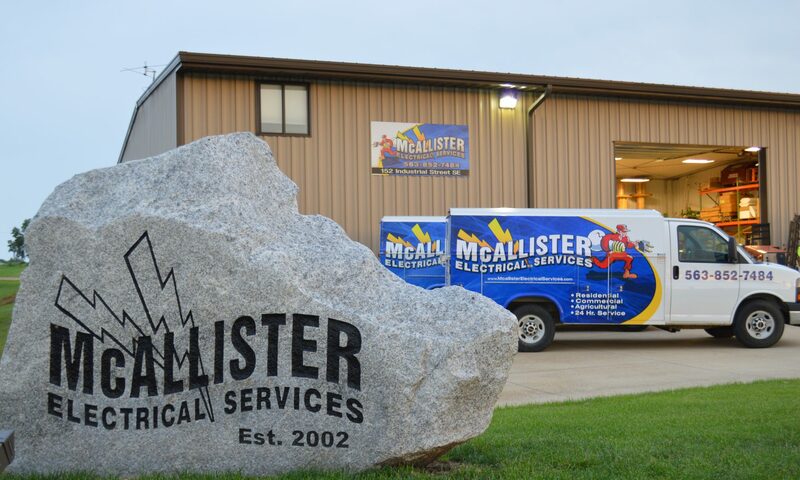 The energy-efficient electricians at McAllister Electrical Services want you all to enjoy your holiday celebrations while you are also being energy and cost-effective. If you need help during the holidays, give us a call! We’d be happy to provide service that matters in the rest of 2018 and the new year!